The 8th annual Georgia Military Prep School Athletic Auction will be held on Friday, March 11, 2016 at 6:00 p.m. in the Kidd Center. The proceeds will help the full range of prep school athletic teams as they prepare for the 2016-17 season. The generous support of many during last year’s auction helped to make our athletic season an exciting one - we captured state titles in softball, raiders, girl’s track and literary competition. Each year attendance has grown and we are looking forward to hosting more than 300 people at this year’s event which will feature a lively silent auction, an exciting raffle, delicious food, and engaging and enjoyable socializing. As always, 100% of the money raised at this event will be used to provide our student athletes with the necessities for a quality program. 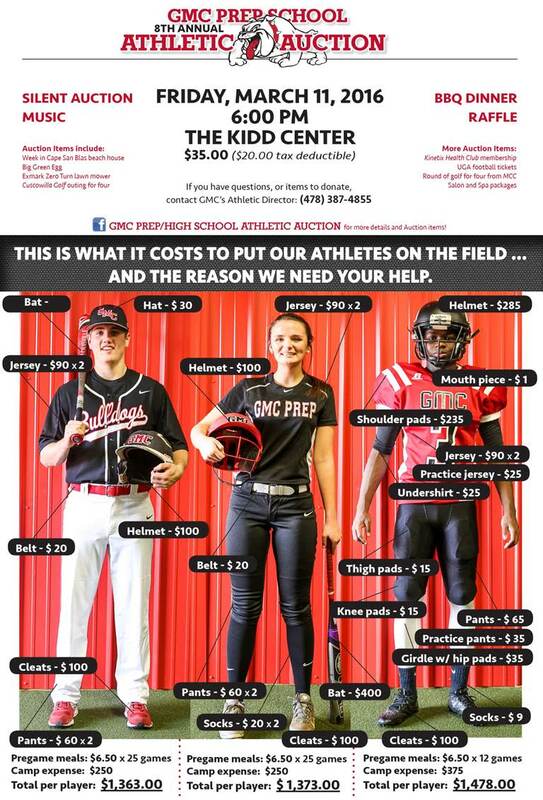 For further information about the auction, or if you would like to donate an item, please contact Steven Simpson, GMC Prep Athletic Director, 478-387-4855.